Enjoy swimming and your favorite water sports, have fun in the local feasts, savour the local dishes and famed wines in restaurants, taverns and ouzeries stroll around the countryside and the lovely village streets, visit the handicraft shops, revel in the intense nightlife. Discover Parikia, the capital, visit the famous church of Katapoliani, one of Greece’s most important Byzantine monuments, impressively preserved, the Venetian castle, and the Archaeological Museum with its exhibits from the ancient history of Paros and Antiparos. Discover Naoussa which is north of the island with its whitewashed alleys, picturesque fishing port and beautiful nearby beaches. Lefkes and Marathi which are in the middle of the Island with the ancient quarries of the famous Parian marble. The monasteries of Longovarda, Christou tou Dassous and many others. 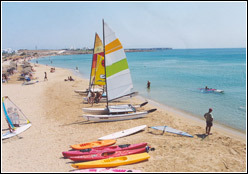 The tranquil fishing village of Aliki is on the south west of the Island with sandy beaches around. It is well worth discovering the south east district from Marpissa to Drios is maybe the most beautiful in Paros, with picturesque villages and fishing ports (Marpissa, Pisso Livadi, Logaras, Drios), exquisite sandy beaches (Pisso Livadi, Logaras, Pounda, Messada, New Golden Beach, Golden Beach and Drios), interesting sights, warm island hospitality and model tourist facilities. Famous worldwide to fans of watersports, especially windsurfing, it also offers a variety of vacation possibilities for every taste, discover it by yourself and find out how many more surprises it holds. Distances in Paros are short, the roads are good and every ride has its own charm, with breathtaking views over the Aegean sea and the surrounding islands. 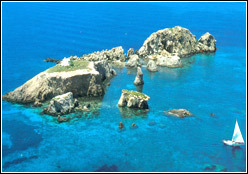 You can also take a trip to nearby Antiparos and visit its spectacular cave and turquoise-water beaches. And don’t forget that Paros due to its position and importance, is linked not only to Piraeus (The port of Athens) and Rafina, but also to all the islands of the Cyclades, the Dodecanese, Samos, even Crete island and Thessaloniki which is the second biggest city in north Greece. The possibilities offered are limitless, both in moving around and in your stay, since Paros has an excellent tourist infrastructure. 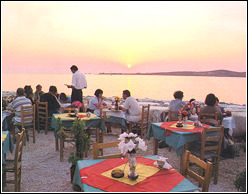 We are sure all this will entice you to become fans of Paros. Have a nice holidays!